A press release issued today by the National Science Foundation highlights a recent study that shows that seagrasses are able to store as much carbon as forests. Florida International University and the National Science Foundation's Florida Coastal Everglades Long-Term Ecological Research site worked together with scientists from Spain, Australia, United Kingdom, Denmark, and Greece to determine that, although seagrass meadows occupy less than 0.2 percent of the world's oceans, they are responsible for more than 10 percent of all the carbon buried annually in the sea. "Seagrasses are a vital part of the solution to climate change and, per unit area, seagrass meadows can store up to twice as much carbon as the world's temperate and tropical forests. The [study] results demonstrate that coastal seagrass beds store up to 83,000 metric tons of carbon per square kilometer, mostly in the soils beneath them. As a comparison, a typical terrestrial forest stores about 30,000 metric tons per square kilometer, most of which is in the form of wood," the press release stated. "Seagrasses have the unique ability to continue to store carbon in their roots and soil in coastal seas," said James Fourqurean, Florida International University scientists and lead author of the study. "We found places where seagrass beds have been storing carbon for thousands of years." And like forests that are subject to deforestation for land development and lumber, seagrasses are among the world's most threatened ecosystems. Some 29 percent of all historic seagrass meadows have been destroyed, mainly due to dredging and degradation of water quality. At least 1.5 percent of the Earth's seagrass meadows are lost every year. 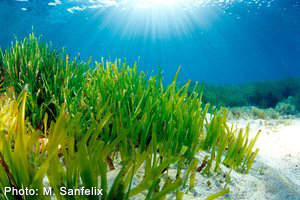 Seagrasses can, when properly managed, regenerate themselves, perhaps even better than denuded forests. According to Karen McGlathery, one of the study's co-authors and a scientist at the University of Virginia, "One remarkable thing about seagrass meadows is that, if restored, they can effectively and rapidly sequester carbon and reestablish lost carbon sinks." Besides the ability to sequester carbon, seagrasses play an important role in filtering sediment from the ocean, protecting the shoreline from flood and storm damage, and providing shelter for a variety of marine life and their offspring. The study's conclusions emphasize the need for conserving and restoring seagrass meadows as they reduce greenhouse gas emissions and increase carbon stores while delivering important ecological benefits to coastal communities as well. yeah but...unlike tress which hold carbon for 100's of years seagrasses come and go like the wind with a life expectancy and carbon hold of...6 months, less in seasonal climes? i will stay with trees thanks all the same to seagrasses.